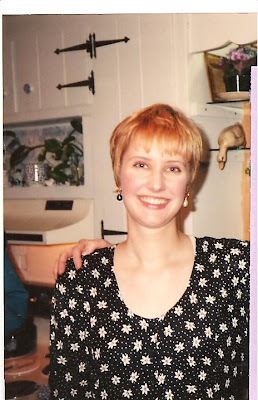 It has been awhile since I've publicly humiliated myself with a trip down the memory lane of hairstyles (see Part I here and Part II here). Don't worry, I can take it and will see this series through to the bitter end. 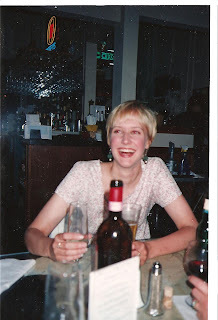 Lest you think I'm "so brave" for doing this, I'll preface this post by saying that these next few shots are from a period in my life where I was pretty happy with my hair, or lack thereof. Going super-short (and super blond) was freeing and fun and kicky and spirited and all those other obnoxious adjectives you'd expect to see in a Keds ad. Here is the first photo, taken in the early 90's, about 1992. Please note the absolutely hideous outfit that I am wearing. It was one of those voluminous one-piece, flowing pant suits, so, yes, that pattern goes all the way to the floor. Moving on, this was also a time of lots of drinking; in this photo, I'm in a baby-doll type dress (channeling Courtney Love, minus the authenticity). Finally, we shoot forward to mid-1996, a mere six months before I met Fairly Odd Husband. 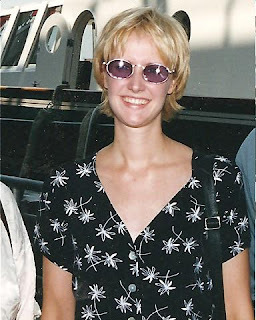 You can tell that I'm getting tired of 'short-short' and starting to grow out the back a bit (yes, I miss those sunglasses, and, no, that is not the same dress as in photo #1). Next up: Lady in Red (hair). I think these hairstyles are cute! Oh my gosh, I wish I could wear short hair like you. You have the perfect face for it. I thought you looked cute. Found you through a league of extrodinary ladies. Thought I would stop by and say hi! You looked great with the short hair! I remember LOTS of my friends having that very haircut in the early 80s. You'll note that I'm not posting old pictures of myself. Mmm, no. I can't believe no one else is saying it but that last picture you look exactly like Meg Ryan from the same time period! That's amazing! You're hot! I had one of those outfits too. Mine had wide legs and it had buttons down the front. I think is was Rayon. I think your hair is adorable. I'm a new reader and this is the first time I've seen your picture. You look beautiful in all of those pictures! Have a great week! Can't wait to see the red hair! Anyone ever tell you that you look like Anne Heche (minus the crazy, of course) in that last photo?? This is a cool segment you started. I am enjoying it! I agree, though. I've never been able to have short hair. You looked cute! I went through the early 90s hippy dippy chick Singles era overexcessive Sun In long hair so I was on the opposite end of the spectrum until I got a promotion at work and got a "PR" do. Wait, I think I took that second picture! I still have the next one in the roll, with us drunkenly hugging. Talk about bad hair? It's me, next to you, channeling Elaine circa 1992. I had a very similar early 90's haircut! I call the last one "The Meg Ryan"
And "OW" (sang like Prince) for the glasses. Disney was ultra-fab. Email me sometime & I'll give you the little bit of scoop I might have! Flippin' adorable! And I mean that in a good way! I could never wear short short hairstyles because my face weighs 32 pounds. And props for posting that picture of the perm. I totally respect you 100 times more than ever. And ditto Meg Ryan. I thought that immediately. ADORABLE! You look ADORABLE! 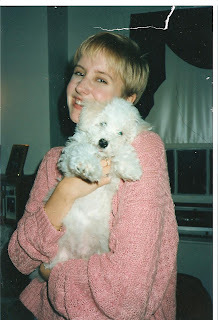 I think that i've been stuck in the early 90s pixie phase for the past 12 years. How sad. Can I Get a Second Chance?